No bake desserts are always a big hit around here. Especially when we are in a hurry or need something quick, like when your teenager says they signed you up for a dessert that they need that day! Ahem. 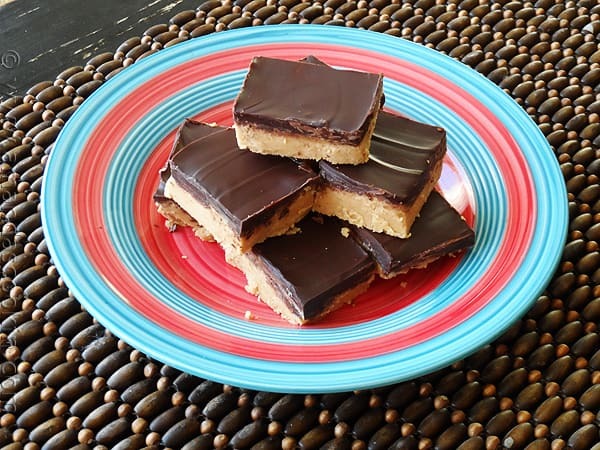 Peanut butter bars are always popular with everyone, especially my kids. 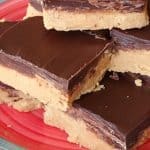 So when you combine peanut butter and chocolate and it’s a no bake dessert, you definitely have a winner! This recipe uses semi sweet chocolate for the topping. If you want it a big sweeter, and closer to the flavor of a Reese’s Peanut Butter Cup, simply substitute milk chocolate for the semi sweet. I prefer to use baking chocolate, but you can certainly use chocolate chips instead. These are so easy to make and believe it or not, they’ll be cut into squares and ready to be eaten in 30 minutes or less! Great for unexpected company or that last minute teen request. Chances are you have most of these ingredients in your pantry, if not all of them! Do these taste like Reese’s Peanut Butter Cups? Yes, however, as I mentioned before, Reese’s uses a milk chocolate, this recipe uses semi-sweet chocolate. They are pretty addicting, so watch out. Save some for yourself, but send the rest packing, or if you like, freeze small batches of them for later. Do you have any favorite no bake desserts? Care to share? 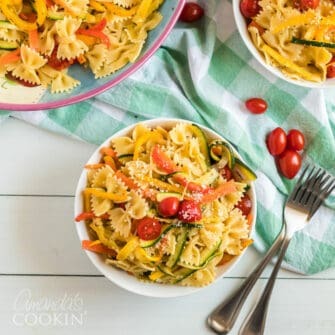 With spring and summer on the horizon, and hot weather arriving soon, baking is not as welcome in the kitchen as it is in the cooler months. So I am all ears and would love to hear your ideas and recipes! Here are a few more that I found that you may like. In a mixer or a food processor, combine the first four ingredients until smooth. Spread into a 13x9 baking pan. 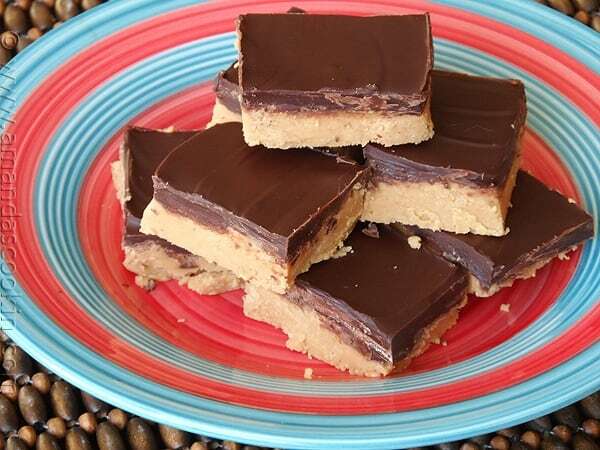 For the topping, melt the chocolate and peanut butter together in the microwave for 1 minute. Stir. If not completely melted you can heat in 10 second intervals until smooth. 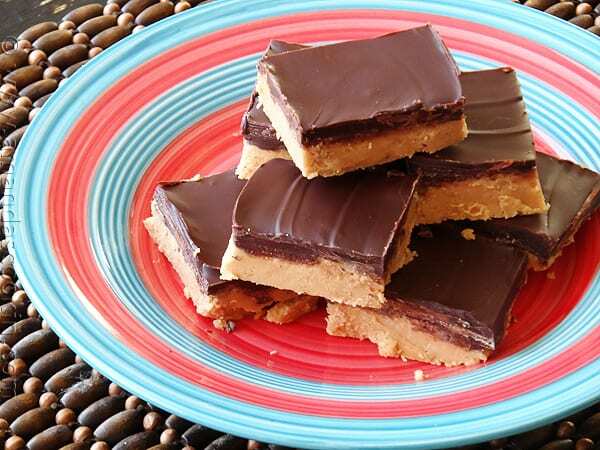 Spread over the top of the peanut butter layer. Chill dessert in the refrigerator for about an hour, or in the freezer for 15 minutes. Cut into bars and serve.